Favourite sweets: Marshmallows. Favourite wildflowers: Marsh Mallows. Coincidence? Certainly... in fact they are both obtained from one and the same plant, Althea officinalis. 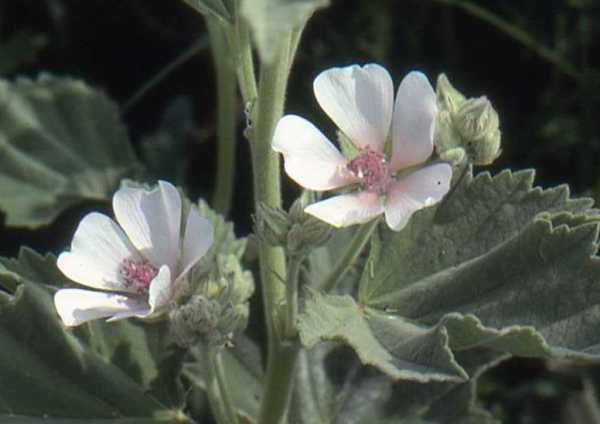 Marsh Mallow grows up to 1.5 metres in height and its lovely flowers are very pale pink and, at about 4cm diameter, slightly smaller than the flowers of Common Mallow Malva sylvestris. The triangular, downy grey leaves are soft and pleasant to the touch. 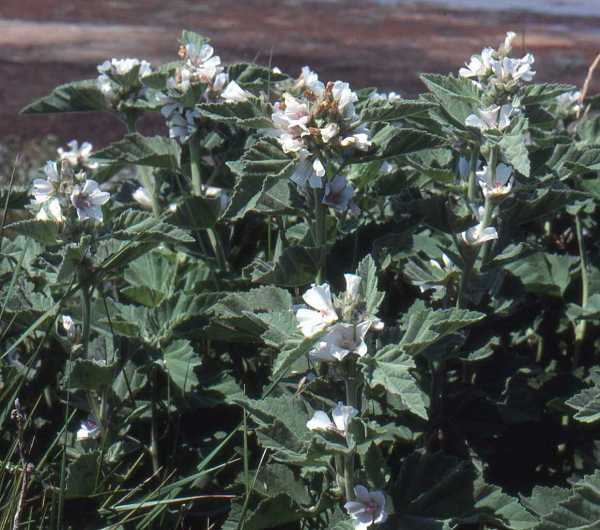 In Britain, Ireland and other parts of Northern Europe Marsh Mallow blooms from August to September; it is most often found in the coastal areas of the south and west of England and Wales. This plant is also spread throughout much of the western Mediterranean region, and there it flowers from July onwards. The favoured habitats of Marsh Mallow are coastal wetlands and saltmarshes. In Britain, Ireland and and other parts of Northern Europe Marsh Mallow blooms in August and September. Althea, the genus name, may come from the Greek althos, meaning 'healing'. The specific epithet officinalis means official and indicates that this plant is (or was) considered to have pharmaceutical properties. The fruits of the Marsh Mallow plant have also attracted attention. They are rounded, and as a result the plant has been called Billy Buttons, Cheeses, and even the Pancake Plant. 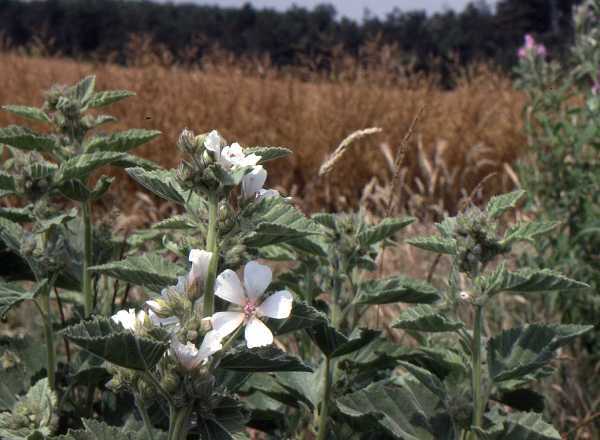 Pictures of Althaea officinalis on this page are shown by kind permission of Anne Horsfall.